This show features works by RAA&M Contributing Artist Members whose work reflects a broad range of artistic styles and mediums, including Winner of the RAA&M Award for Excellence in Any Medium, Larry Grob, for his piece entitled Seaside, Swan’s Island, Maine. From the Museum Collection at the RAA&M, Pearson, Stone, and Cady highlights former artist members from the Cape Ann School of Art. Now is your opportunity to add your own genuine Marguerite Pearson, Don Stone, and Harrison Cady to your art collection. The RAA&M hosts a one-artist show for Photography Artist Member and Governor of the Board, Steve Howard, entitled Solariazation. The RAA&M Figure Sketch Group consists of Artists Members, Contributing Members and Community Members who sought to work through a more comprehensive study of the figure from life or an opportunity to create a completed figurative work. This exhibition highlights some of the pieces completed during their weekly meetings. For more information, check out the Figure Sketch Group page. The 2019 Exhibition Season begins with a show featuring small works by our Painting, Graphics and Sculpture Artist Members, including Winter Group Show Award Winner, Olga Gernovski, for her piece entitled Sunflower in a Vase. The works in this show are conceived as a tribute to the elderly of Lisbon, Portugal, as well as elderly anywhere. They have two sources: (1) photographs Otto took in 2003 that were affixed to house walls in the medieval district of Mouraria, Lisbon, and (2) variations of self-portraits Otto took in Lisbon in 2009. The Experimental Group (EG) is part of the Rockport Art Association & Museum. The EG is a community of artists devoted to sharing and developing their ideas on artistic expression. As an ongoing forum for passionate communication, it delivers liberating and meaningful experiences for both artists and viewers. 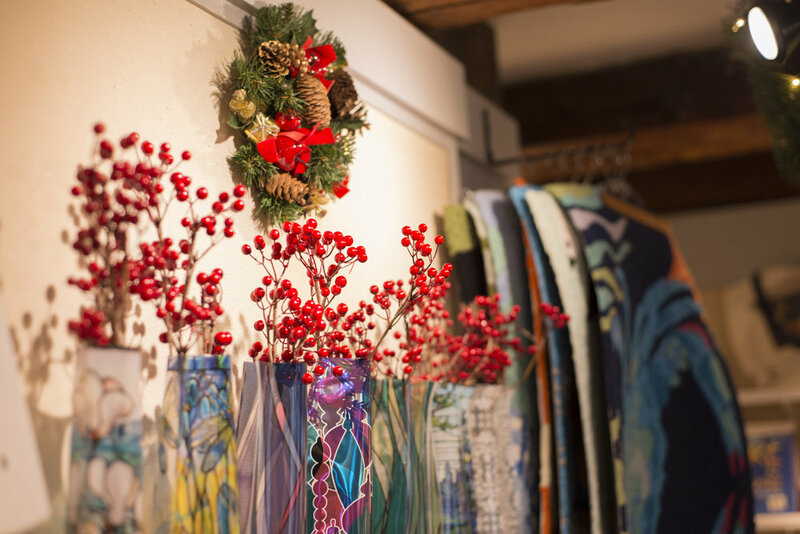 Join the Rockport Art Association & Museum for our Art & Sea Gift Shop Open House to start your holiday season! Free Artist Member Exhibition Catalogue (Choice of Three - Anthony Thieme, Harry A. Vincent, A.N.A. & His Contemporaries, or W. Lester Stevens, N.A. - $24.95 to $29.95 value) with any $30 Gift Shop purchase*. Note : limit one free item per customer. Color Transitions is an exhibition of oil paintings by artist Olga Gernovski that celebrates the sunlight through the leaves, through the flowers, and the inspiration of what nature is generously giving us every day. This exhibition represents fall, Olga’s favorite time of year - the most colorful season, and opens Thanksgiving weekend when people are grateful for many things in life. An exhibition of oil paintings by Gloucester artist, Paul Ciaramitaro, will open in the Marguerite Pearson Room of the Rockport Art Association & Museum. Paul Ciaramitaro is primarily a realist painter, however he occasionally enjoys painting in a Cubist style and his creative explorations in Cubism are featured in this exhibit. Over the past several decades, Paul has taught numerous classes and workshops, which have been widely attended, and he has served as a juror for many exhibitions. He is a juried artist member of both the North Shore Arts Association and the Rockport Art Association &amp; Museum. The Rockport Art Association & Museum is very pleased to announce and welcome our new exhibiting artist members in painting, graphics, sculpture and photography! Medley - An exhibition of paintings by Barbara Donnelly will open in the Marguerite Pearson Room of the Rockport Art Association & Museum. As well as painting New England, she has enjoyed painting abroad, studying the varying light, landscape and architecture in France, Ireland, Scotland, Canada, Puerto Rico, Portugal and China. Her work has found collectors in each of these countries. Rockport Art Association & Museum’s Photography Members contribute new works for this current exhibition in the Wengenroth Gallery. Registration at RAAM at side gate. We will accept up to 120 artists total, including CAPA 40. (Note: Rockport Music parking lot will be available for registration ONLY). Artists drop off work at RAAM at side gate. The Rockport Art Association & Museum is looking for volunteers for a fast fun filled day starting at 7:00am. If you can spare two or three hours helping register, assist with lunch for the artists and exhibition set-up, and clean-up, please contact Karen Berger goberger@gmail.com or 978-546-7399. RAA&M is always looking for volunteers in other areas as well, please feel free to sign up here as well.